So what to do with the Giant Summer Squash……. That is the real question!!! First of all you need to FREEZE some of that yummy summer squash to enjoy when summer is long gone. It’s so easy to freeze you won’t beleive it. Shred the Zucchini – Simple enough, right? When I have a lot of zucchini on hand, I like to use my food processor for this, but a box grater works just as well. I generally don’t peel the zucchini unless the skin is particularly tough. If you have giant leg-sized zucchini, just scoop out the mature seeds from the center and shred the rest of the zucchini. Portion Out the Zucchini – It’s easiest to store the zucchini in portions that work well for recipes. My preference is to store the zucchini in 1 cup portions. Simply measure out 1 packed cup of shredded zucchini and transfer it to a zipper sandwich bag. Seal the Individual Bags – Be sure to squeeze the air out of each sandwich bag and seal them well so that the zucchini keeps well. Double Bag and Label – Sandwich bags aren’t really designed for freezer storage, so I like to double bag my zucchini. I put 4 of the small sandwich bag portions in a larger freezer bag. Then, be sure to label the bag so you remember what it is in a few months when you’re digging through the freezer. Freeze It! Just put the zucchini in the freezer and you’re good to go. This cake is easy to make and super moist, but the real star is the crackle lemon glaze that is brushed onto the warm cake. It is fantastic! Preheat the oven to 350° F. Grease two loaf pans (or a 10-inch bundt) and dust them with flour. Place the walnuts in a single layer on a baking sheet and toast them until they are golden brown and aromatic, 12-14 minutes. Cool completely and then finely chop them. Whisk together the flour, baking powder, baking soda, salt, and spices into a medium bowl and set aside. Using an electric mixer, beat the eggs, sugar and olive oil together on medium speed until light and fluffy, about 3 minutes, then beat in the vanilla extract. Scrape down the sides of the bowl as needed. Beat in the dry ingredients all at once on low speed until they are thoroughly combined, then switch to medium speed and mix for 30 seconds. Mix in the zucchini and walnuts on low speed until they are completely incorporated. These muffins are just perfect! Preheat the oven to 200°C/425°F Grease muffin tins. Combine the eggs, milk and oil in a large bowl. Combine the flour, sugar, salt and baking powder in another bowl and add to the liquid mixture in batches, stirring to blend. Don’t overblend! Add the zucchini and basil and stir to blend. Fill each muffin cup about 1/2 full. Sprinkle the top with the cheese. Bake for about 20-25 minutes for regular size muffins, 15-20 minutes for the mini muffins, until the tops are golden brown and puffy. Serve while still warm. This spread has a buttery, subtly sweet flavor. it’s quite simple, requiring just a couple of ingredients slowly cooked in olive oil until jammy and buttery. Delicious on toast or sandwiches, it’s a great little staple to have in your summer cooking repertoire Makes about 2 cups. Coarsely grate the zucchini. Let it drain in a colander for 3 to 4 minutes or until you are ready to begin cooking. To hasten cooking time, squeeze the water out of the zucchini by wringing it in a clean cloth towel. In a deep skillet, heat the olive oil/butter. Sauté the shallots briefly. Add the zucchini and toss. Cook and stir over medium to medium-high heat until the zucchini reaches a spreadable consistency. If you scorch the bottom, turn the flame down! (And scrape those delicious bits into the marmalade for added flavor.) The zucchini will hold its bright green color and slowly caramelize into a nice vegetable jam. Enjoy on toast, or as a side dish all summer long! *Feel free to add extra zucchini. It may take a little longer to cook, but this recipe keeps well and can be stored in the refrigerator for about a month. Preheat grill to medium-high. Combine basil, pine nuts, oil, Parmesan, garlic, lemon juice, and salt in a small bowl. Coat both sides of squash slices with cooking spray. Grill the squash over a high heat until browned and tender, 2 to 3 minutes per side. Serve topped with the pesto. Heat the oven to 350°. Grease a 9″x5″ loaf pan (you can use coconut oil if you like). In a large bowl, combine the white whole wheat flour, baking soda, baking powder, salt, cinnamon, nutmeg, and coconut. Set aside. Stir the melted coconut oil into the wet ingredients, then fold the wet ingredients into the dry ingredients and stir gently just until combined. Spread the batter evenly in the prepared pan. Bake for 50 to 60 minutes, or until a toothpick inserted into the center of the loaf comes out clean. If the top of the loaf starts getting too dark (check after about 40 minutes), cover it lightly with a piece of foil for the remaining baking time. Let the zucchini bread cool in the pan 10 minutes, then carefully remove it and cool completely on a wire rack. Store in an airtight container at cool room temperature for up to three days or freeze. Tastes great sliced and toasted! These chips taste kinda like thin & crispy pumpkin seeds. (I guess that shouldn’t be too much of a surprise since they are relatives in the squash family). Much lighter, but the taste is similar. Preheat oven to 225 degrees Fahrenheit. Line a baking sheet with parchment paper or nonstick foil, and spray with canola oil. Set aside. Slice zucchini into thin medallions, about the thickness of a quarter. (You can either use a knife & a very steady hand, or a mandoline slicer.) Lay out slices on prepared baking sheet, and spray tops lightly with additional cooking spray. Sprinkle with seasonings of your choice. (A note on seasoning, however – use LESS than what seems appropriate. These shrink considerably in the oven, and if you use too much it gets very concentrated. It’s better to end up under seasoning and add more later.) Place in preheated oven and bake 45 minutes. Rotate baking sheet, and bake an additional 30-50 minutes, until chips are browned and crisped to your liking. These are best eaten within a couple hours of removing from the oven, as they start to get chewy if left out. One zucchini makes one serving (1/4 C. – 1/3 C. of chips depending on the size of your squash). “pasta” right before your eyes, just work the sides and when you reach the seeds, give it a turn. The core of the zucchini will be left which I then dice and roast up for future use. First, roast off the veggies of your choice (tomatoes, peppers, cauliflower, etc) in a 425 degree oven tossed with olive oil, salt and pepper, then set aside. Have your zucchini “pasta” all ready to go – then heat up a large saute pan drizzled with olive oil, add shaved garlic and red pepper flakes, saute until garlic is light golden. Next, add zucchini and cook for only about 2 minutes tossing with some tongs just until wilted and still al’ dente. Remove pan from heat, add the roasted veggies, fresh basil, lots of grated romano cheese and of course another drizzle of olive oil! Preheat the oven to 300 degrees . Place a cooling rack on a baking sheet and set aside. Using the large holes on a box grater, grate the zucchini into a large colander. Toss with 1/2 teaspoon salt and let stand for 10 minutes. Place the colander in the sink and press the zucchini firmly with paper towels to remove all the excess moisture. In a large bowl, whisk the eggs with 1/2 teaspoon salt and 1/2 teaspoon pepper until light and frothy. Using a whisk, stir in the zucchini, then the flour. In a large nonstick skillet, heat 2 tablespoons olive oil over medium-high heat. Working in 3 batches, drop in the fritter batter by rounded tablespoons, gently flattening with the back of the spoon, and cook, turning once, until the fritters are browned, 1-1/2 to 2 minutes per side. Transfer to the prepared baking sheet and keep warm in the oven while cooking the remaining batches; add more olive oil to the skillet as needed. Red Pepper Dip: Using a food processor, puree the red peppers with the garlic, the remaining 1 tablespoon olive oil, 1/2 teaspoon salt and hot pepper sauce to taste. 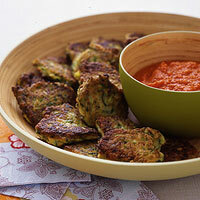 Serve the dip with the warm fritters. Use your usual toppings for this healthy, substantial, yet tender crust. A food processor with grating attachment works best for zucchini and mozzarella. You can make this crust up to 2 days in advance of use. Preheat oven to 400 degrees F. Generously oil a 10 inch pie pan and coat lightly with flour. Combine zucchini, eggs, flour, mozzarella, parmesan, herbs, 1 Tbs. Olive oil in a bowl; mix well. Spread mixture onto prepared pan. Bake for 35 to 50 minutes (watch it or until golden brown). About halfway through baking, brush with remaining tbs. of olive oil if desired. Remove from oven. Cool for 10 minutes, and use a spatula to loosen crust from pan to avoid breakage later. Top with your favorite pizza items and bake at 400 degrees F until heated through. These pancakes are delicious for breakfast, brunch or just as a snack anytime. Wash and grate on the large holes of box grater or in a food processor shredder (DO NOT PEEL). In a large mixing bowl, beat eggs; add shredded squash and mix well using a fork. Add flour, sugar, salt and olive oil and stir well to blend. Finally, add baking powder and mix using a spoon (Batter consistency should be like heavy whipping cream). Preheat griddle to 425- 450°F. If using a heavy duty frying pan, heat to medium-high heat; adjust heat if necessary. Rub grill or frying pan with oil before cooking each batch of pancakes. Spoon batter onto hot griddle (about 2 tablespoons for each pancake). Cook until bubbles on the top of the pancake almost stop, about 1 1/2 minutes; turn pancake over and continue to cook for another 1 to 1 1/2 minutes or until pancakes are done. When done, rub pancakes with melted butter and place in a preheated 250 F oven to keep warm until the remainder are cooked, or serve immediately. Serve with your choice of jams or syrups. Also very good with sour cream or yogurt along with your choice of jams or syrups, or you can eat them just plain.